Perennial leeks are rare and difficult to find in Australia for some reason, yet they are simple to grow and one of the best and most productive vegetables to grow for home gardeners. I would hate to be without them again, if we ever lost them in a bushfire or something I would be devastated. 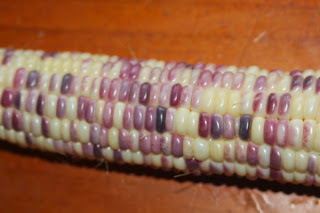 I have had a lot of questions about the perennial leeks from different people, so thought it best that I write another post and answer some of them. What are they, how to grow perennial leeks? I have some growing notes here. I will tell you a few things now that were not covered in my growing notes page. Perennial leeks are an amazing plant, they are hardy, productive and delicious. People often ask when to plant perennial leeks, we plant and divide perennial leeks all year. When we harvest a leek for dinner I then plant the small baby leeks that are growing from the large one's base. It is only over the hotter summers when the plants are dormant that we do not harvest leeks, even then I occasionally dig up the bulbs and plant them out in other places. Even when we lived near Canberra we could divide and plant them all year, the frost and the heat does not seem to be too much of an issue with them. Summers here are extremely hot and dry and the leeks tend to die down to bulbs, in cooler climates or even cooler years they grow all year. They flower here but generally nothing comes of it. One year after floods we had them set viable seed which I think was a cross between the leeks and elephant garlic, that year the flower heads also grew small leek bulbs in the same way that tree onions grow small onions on the flower stalk. These things have only happened that once and I have not been able to convince them to flower since. Some people ask me how they compare with other types of leek. When I wrote my first perennial leek post I had never grown or eaten any other varieties of leek to be able to compare, since then I have grown and eaten some regular leeks so can compare them. I considered buying some leek seeds to grow, but I have grown onion seed and find them fiddly so did not want to do that if I did not have to. The leeks in the supermarket were so much larger, both longer and fatter than the perennial leeks, so we bought some for dinner a few times just to see if they were any better. After cutting off the roots with a few mm of shank I put them in a jar with a little water and they sprouted. We used to do that with the perennial leeks to build up numbers the first year that we had them so figured it should work with any leek. It worked fine and the regular leeks grew well. I then grew the two types of leek, perennial and store bought, in adjacent beds to see how they compared. The store bought leeks taste pretty much the same as the perennial leeks, no noticeable difference there. Some people who I have sold perennial leeks to have claimed that the perennial leeks are sweeter or tastier, but I am not convinced that I could tell any difference. Both types of leek cooked the same, neither one was tough or bitter or anything like that. While the store bought leeks were larger, the perennial leeks grew faster and sent up a lot of babies and we ended up with a greater harvest of perennial leeks compared to store bought leeks on the same area of land. So from a yield per area of garden the perennial leeks came out on top by a long way. When harvesting perennial leeks there are always baby leeks that you can use as replacements, which maximises the use of space. The perennial leeks reproduce slowly throughout the year, then around November they explode in numbers. From one well grown plant I ended up with 128 leeks in 12 months. During this time I would have been able to eat leeks as well as increase their number had I wished. The store bought leeks did not flower in the 12 months, but I assume had I left them in for another 6 months or so they would have flowered and produced hundreds if not thousands of seeds. I guess there is a trade off here, the store bought leeks would have reproduced more than the perennial leeks if they had more time, but we would not have eaten leek during that long time. The time it would take to go from a seed to an edible leek is also a lot longer than to go from a baby perennial leek to an edible sized leek. When saving leek seed it is advisable to grow out at a minimum of 80 plants to prevent problems with inbreeding depression, you would then rouge out any plants with undesirable characteristics (minimum numbers based on info from http://www.seedalliance.org/uploads/publications/Seed_Saving_Guide.pdf). That is a lot of space to tie up each year just to produce leek seed for the following season. Leek seed is only viable for a year or two, so you would end up having to tie up that much space all the time just to produce leek seed, you would then have to allocate another bed to produce leeks to eat. Of course you could just buy leek seed each year, but then you may as well just buy leek from the supermarket to eat and use your vegetable plot for growing something else. When growing perennial leeks you can grow a single plant if you wanted to and build up numbers from that, there will be no inbreeding, and rouging out is not needed as every baby it produces will be genetically identical to the parent (this is not exactly true as sometimes mutations pop up, but that is an in-depth topic that is best not covered here). There is also no problem with perennial leek about having to isolate plants to prevent them crossing with the neighbour's leeks which can be an issue if you live in town. So from a sustainability point of view the perennial leeks end up as the better option. 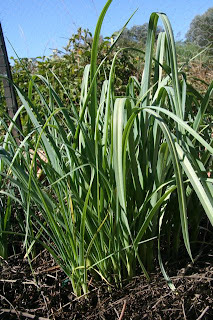 Regular leeks can be grown as perennials, harvested close to the ground and allowed to regrow. Perennial leeks are superior here as they can be grown and harvested the same way but continually reproduce and allow you to build up numbers if you wish. Regular leeks are a bit larger, but the ones I grew were nowhere near as large as they originally were in the store, perennial leeks are a bit smaller. I assume that if I grew the perennial leeks better they would be a bit larger, but I also think that regular leeks will always be a bit larger than perennial leeks. If you do not divide them, the perennial leeks end up as a clump of hundreds of plants that are as thin as chives. This can be a down side of perennial leeks, it can also be easily avoided by dividing some of them occasionally. One of the store bought leeks grew with a red stem and looked nice, the perennial leeks were just green. Occasionally a variegated perennial leek turns up, but other than that they are just green. I like the look of the variegated perennial leeks myself but they only seem to turn up occasionally. At the end of the day these are a food plant, looks are secondary. To the best of my knowledge there is only one or two varieties of perennial leek in Australia whereas there are a whole lot more varieties of seed grown leek. Some types of seed grown leeks are suited to warm climates and others are suited to cool climates. Some grow long and thin whereas others grow short and fat, apparently each of these types is better suited to different climates. I have sent perennial leeks to a few parts of the country and so far am yet to find a climate in which they are not productive. This lack of choice with varieties is not an issue as I am happy with these perennial leeks, if they were not fantastic then this lack of choice would matter a whole lot more. From what I have been told perennial leek will cross pollinate with any variety of regular leek and they say that the offspring are less desirable than either parent, so if you grow both it is best to remove the flower stalk from the perennial leek to prevent problems. I have never let regular leeks flower so can not say too much about the subject. Perhaps if you were to let a regular leek flower next to a flowering perennial leek you could grow the resultant seed and perhaps get a new type of perennial leek! Over all the perennial leeks were a lot easier to grow, they were producers of food throughout the year, they were producers of huge amounts of food for a small area, and I know that if I forget about them for a year (or ten) that they will still be there waiting for me. After growing the two types of leeks and comparing them I don't think I can be bothered growing regular leeks again and will stick with the perennial leeks. I understand that there are many varieties of regular leeks and someone should preserve them and prevent them from going extinct, but that someone should not be me at this point in time. I am happy with perennial leeks and at this stage want to spend my energy saving seed of other things. I do have perennial leeks for sale as well as some seeds, herbs and other perennial vegetables on my For Sale page. I am not keen on posting outside of Australia unless you have already contacted your country's quarantine and are confident that they will be allowed through. That being said I am happy to try my best to answer any questions about perennial leeks from people even if they are overseas. I have since written a better comparison with pictures I did of growing seven regular leeks and seven perennial leeks for 12 months side by side. If you are interested it can be found here. I bought some perennial leeks and grew them without harvesting any in the first year to allow them to multiply quickly. In the next year the two year old original bulbs and some of their baby bulbs (which were also two years old) flowered and set seeds ...oodles of seeds!! I also read that you can grow bulbils on the flower head instead of waiting for seeds to develop ...by cutting off the tip flowers ...this loss of the immature flowers prompts the leek to create bulbils on the flower head to replace the seeds as the bulb dies after flowering ...though of course the offset bulbs around the base of the flowering bulb will continue to grow. I did try this method of cutting the little tip flowers off to generate bulbils on the flowerhead ...this did work but didn't produce very many bulbils ...possibly because the weather turned hot and the bed started to dry out. I think these perennial leeks are amazing. 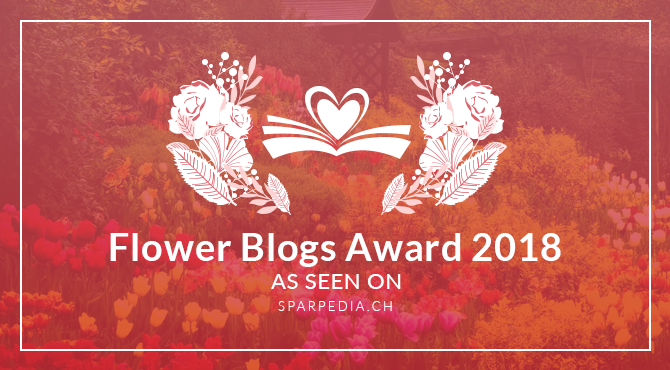 Thank you for the kind words about the blog. I am glad the perennial leeks are growing well for you. I really like the perennial leeks, they are true survivors and sure are a very productive vegetable. They don't flower each year in my climate and they rarely produce any seed for me. I can't believe yours are setting seed, that is great! 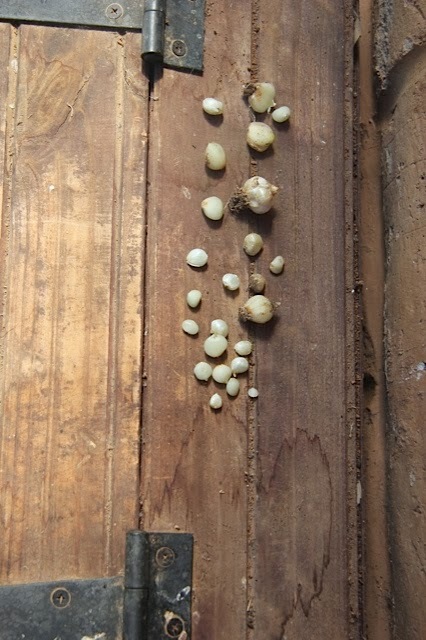 Mine have only set viable seed after crazy weather and I am pretty sure it crossed with Giant Russian Garlic (which is botanically also a type of leek) as the seedlings are all unique and have characteristics of both. A valuable home garden plant. I find it difficult to give them away. As you point out, onion family can be a hassle to sprout, store and it's fussy about its soil media. Perennial leek avoids these issues with its peerless hardiness and rewards one seasons patience and plant division with limitless leeks to eat. I'm sure most gardeners in the hottest/most-humid parts of Australia have given up on onions. Would be good to share this plant with the Top End. Oh and it travels in the post really well too.